Jim Acher at Ocean Independence in Palma says the time has come to sell his central listing, the 27.4m sailing yacht Lisheen Lady so she's had a €150,000 price drop. According to Jim, she’s a one of a kind sailing yacht with a high bow and fine entry, assuring an ocean going ability, even in difficult sea conditions. She has sufficient water and fuel storage to cross the Atlantic and is capable of 10-12 knots under sail. Her interior has been meticulously improved and maintained, with the generous wheelhouse providing ultimate protection from the elements, allowing comfortable sailing in any weather. 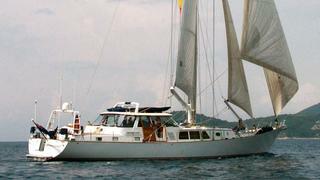 Lying in Palma, Lisheen Lady is now asking €1.15 million.